Which gives the stern'st good-night." 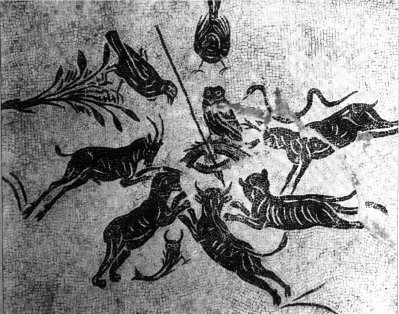 This Roman mosaic featuring an owl was intended to counter the evil eye. Click the play button to hear the owl again. The origin of this webpage: This webpage was originally created because of a thread that was going on in alt.folklore.ghost-stories some time ago about the legendary creature known as the Lechuza. This discussion eventually included some side topics of legends regarding various birds, one of them being the owl. Supernatural legends aside, I think the owl is one of the coolest animals ever created. Built to fly with perfect silence, with sight and hearing optimized for hunting at night, it sweeps across the forests bringing swift death to small animals as it seeks its prey. If I suddenly gained the magical ability to shapeshift, the owl is the first creature I would try out. During the time this thread was going on, I heard some barred owls begin to call one night at my house. Seizing the opportunity, I grabbed a tape recorder and got them on tape. I don't have any fancy equipment, just a Radio Shack tape recorder and the Cool Edit program (the mp3s were made with Gold Wave). These aren't the best quality recordings, but it should give the listener a pretty good idea. There's a sort of metallic hum in the background, that's what's left of the tape hiss and ambient noise after filtering out as much as I could. There are 6 clips in all, in *.wav format but zipped to save space and download time. All the clips are in the order of their being recorded. A brief description of each clip follows below. 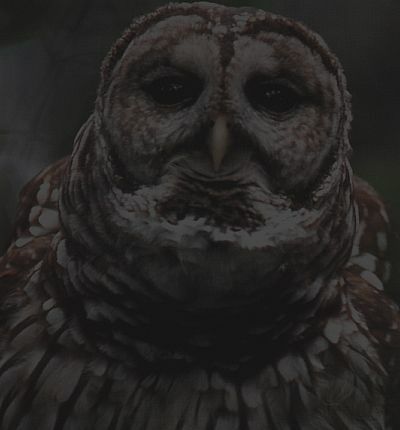 Since this website has drawn overwhelming traffic from people who are simply interested in owls, and almost zero traffic from people interested in folklore, all the folklore links and references have been removed. Now it's just an owl sounds page. Also please note that I don't have any further items or information regarding owls other than what is included on this site. So if you are looking for pictures or more sounds, I don't have them. Feel free to follow some of the links below or keep exploring all the various search engines available to help you find what you're looking for. Update: August 4, 2001. Now I've also included some mp3 conversions that I made of the old wav files, with much better noise reduction and vastly reduced size. The only one that did not have any further noise reduction made to it is #6. The owls had moved away far enough that their sounds are "down in the noise" and reducing the noise also wiped out their songs. The other 5 sounds are much clearer now, I think. They may not play directly off the site. You might just want to do a right click and save, then listen to them from your own machine. The owls in these recordings live in the Central Texas area east of San Antonio. ZIPs are of 11 KHz, 8-bit, mono wav files. This one is so short I didn't bother zippng it, you should have heard it when the page first loaded. One owl goes solo. This is the largest of the files. In this one you can distinctly hear several different owls, at varying distances and with differently-timbered voices. Near the end at least four of them are all singing at once. This file sounds a lot like #3. You can hear three or four different owls, sometimes singing all at once. In this they really start getting into it. Two or three sing at once, and about halfway through a new voice comes in, another owl with a deep bass voice that is so low it almost sounds like a dog barking (this should be a male, according to the information I've read). Sometimes, when barred owls really get cooking, they start making a sound that's a sort of cackle, or maybe if you had an imaginative bent you might say it sounds like some kind of maniacal laughter. I once heard a parliament (heh heh) of owls do this for about 20 minutes one night, it was so beautifully eerie I had to just sit out on the front porch and listen to it until they stopped. Unfortunately, they didn't quite duplicate the performance for me this time, but they did do just a little of it. You may have to turn the volume up just a little for this one because they had started to move away. This is one of the spookiest sounds you will ever hear when walking alone in the woods at night. If you have an owlish link you would like included here, please email me with the url.